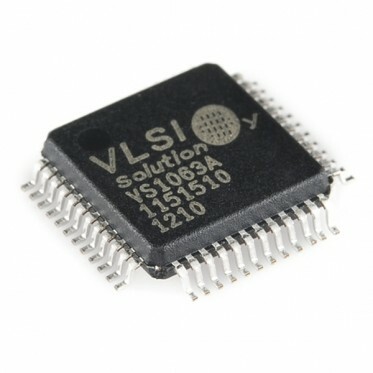 Description: VS1063 is an easy-to-use, versatile encoder, decoder and codec for a multitude of audio formats. They can be hard to get hold of but we've got them! The VS1063 contains a high-performance, proprietary, low-power DSP core as well as ROM memory, 16KiB instruction RAM and up to 80 KiB data RAM for user applications running simultaneously with any built-in decoder! There's built-in serial control and input data interfaces, up to 12 general purpose I/O pins, a UART, as well as specialized peripherals like a high-quality variable-sample-rate stereo DAC and a stereo ADC, followed by an earphone amplier and a common voltage buffer.